(1) Under Dir. Iancu, the USPTO appears to be moving away from eligibility rejections. 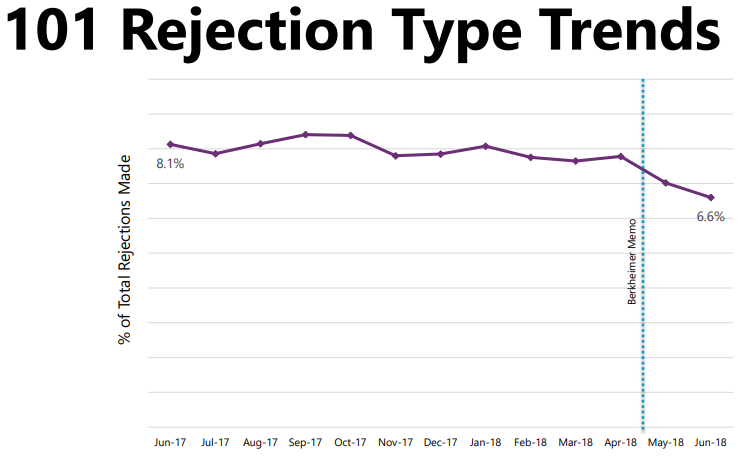 The chart below shows that the past year about 8% of all examiner rejections were eligibility rejections. Over the past three months, that statistic has dropped to about 6.6%. During that time, the PTO has officially changed its approach via the Berkheimer memo, and Dir. Iancu’s leadership lends authority to the Office’s approach to broader eligibility. (2) AIA Trial institution rates continue to fall – although slightly. Post-Grant Review proceedings are not becoming popular. Several hundred patents have been subjected to multiple (3+) petitions challenging validity. 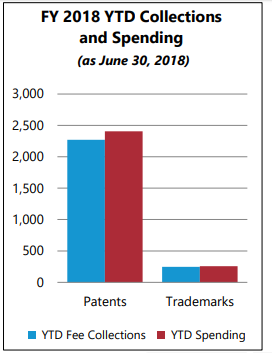 (3) Although I am not clear how this will happen, the USPTO expects that its spending and revenue will level out perfectly by the end of the fiscal year. (4) Several bills are pending in Congress. None are currently likely to pass. (5) Draft of 2018-2022 USPTO Strategic Plan to be released later in August. (6) USPTO AI Conference set for December 5th, 2018, USPTO Madison Auditorium. Thanks Greg. A comparison of your hotlinked slides 53 and 54 givea a breakdown between numbers of petitions vis a vis numbers of petitioners for all IPRs, and does not support the argument that a patent hit with one IPR petition has a high % chance of getting a second petition from the same petitioner. Then what is that number. If I beat one IPR (not instituted), what are the odds the same entity that filed the first IPR is going to file another one. OT, but isn’t the Judge Ellis III now running the Manafort trial with running commentary the same Judge Ellis commonly attributed from some years ago to be the father of “rocket docket” patent trials? 2) Assuming there would be no reason to file a second Petition if the first Petition was instituted, then there would be a total pool of 1,026 denied first Petitions left on which someone could choose to file a second petition. According to the table, there were 885 patents subject to a second Petition. Unless my math is way off, if a Patent Owner prevails in defeating the institution of a first Petition, there is an 86% chance (885/1026) they will see a second Petition filed against the same patent. Would be interesting to see institution/denial stats for 2nd, 3rd, 4th, etc. petitions to fully round out the statistical likelihood for when a Petitioner will actually “walk away” from attempting further Petitions.
? SP, although plural IPR petitions against the same patent are undesirable, I don’t understand your IPR number calculation assumptions. Most of the minority of patents hit with plural IPR petitions are different petitions from different defendants being sued on the same patent. Each defendant is legally entitled to it’s own defense and attorney representation, and may well think they have a good reasons to file their own IPRs. All are subject to the one year time bar running from their suit date. Some petitions may even be for different sets of claims of the patent. And some % of petitions against the same patent will be joined. I cannot understand how you arrived at: “If a Patent Owner prevails in defeating the institution of a first Petition, there is an 86% chance (885/1026) they will see a second Petition filed against the same patent?” Especially if there is only one company being threatened or sued for infringement. Paul – I appreciate your input. Would you happen to have any stats/links you could point to to support the statement that, “Most of the minority of patents hit with plural IPR petitions are different petitions from different defendants being sued on the same patent”? I can see that it is definitely a minority of patents that are hit with plural IPRs (60%+ are instituted on the first petition, leaving only a minority (<40%) likely to ever see a second petition. And, if "most" (greater than 50%) patents facing multiple petitions are indeed being hit with separate IPRs from different defendants (or "interested" parties like RPX or Unified Patents) – are those petitions coming in concurrently or are they staggered, suggesting that the results of a denied IPR are used to strengthen the arguments of the "next" IPR (whether filed by the same petitioner or some other petitioner)? All that is a roundabout way of asking the more generic question, "If a Patent is successfully defended against an initial IPR petition, what are the odds that the same patent will face a second IPR petition?" To me, that is a very different question than, "What % of Patents see 1 vs 2 vs 3, etc. IPRs?". Also – Greg, thanks for the link to the PPT. Although, I did not see stats the above question(s) in there. 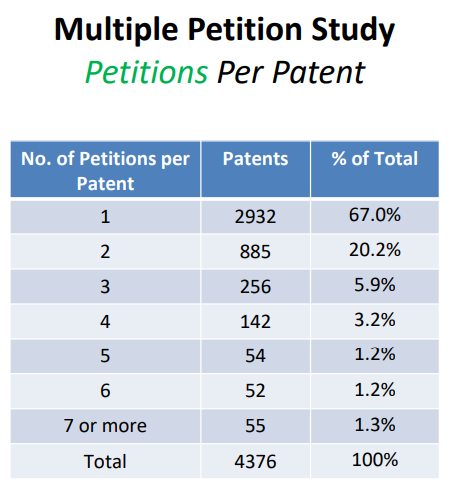 …reads to me that 84.4% of Patents face only one “Petitioner”. Paul – can this be reconciled with the statement that, “Most… patents hit with plural IPR petitions are different petitions from different defendants being sued on the same patent.”? Thanks for everyone’s input and attention to this! Per a recent decision (remanding to make a proper call under at least nominal agency theory), it is NOT correct to say that agents such as RPX or Unified Patents are separate entities. 1906 (not 1096), and like Paul, I do not see the basis for your further assumptions. Look at slide 53 in this deck for an easily understandable breakdown of multiple petitions. Greg, that was an interesting study you hotlinked at 7.3 but on Orange Book challenges not on breakdowns of plural IPR petitions in general. The slides that Paul recommends have a lot of useful info. In particular, slide 23 shows that 64% of petitions result in an IPR being instituted, but 70% of patents challenged end up with an IPR instituted. The delta between those two numbers bespeaks the fact that among the 33% (slide 14) of patents that get hit with more than one petition, some non-trivial number get instituted on one petition but not on another. Greg – Slide 23 is helpful as you point out, showing that as a petitioner (in 2017), the odds of getting an IPR to stick go up the more IPRs one files (jumping from 64% if 1 IPR is filed to 70% if >1 IPR is filed). 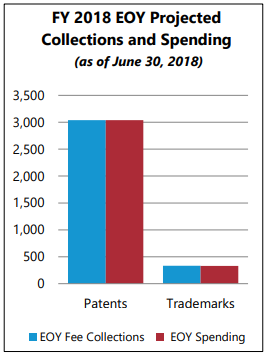 However, this data is still not granular enough to answer the initial question I posed, “If a Patent is successfully defended against an initial IPR petition, what are the odds that the same patent will face a second IPR petition?”. To Paul Morgan’s statement that most patents facing multiple IPRs are coming from multiple filers – Slide 54 shows the opposite. In most cases (84.4%), Patents that face >1 IPR are seeing multiple petitions coming from the same filer. According to the table, there were 885 patents subject to a second Petition. So, there is an 86% chance (885/1026) a Patent will see a second Petition if an initial IPR filed against them filed is denied. “… opposite. In most cases (84.4%), Patents that face >1 IPR are seeing multiple petitions coming from the same filer.” (emphasis added). This indeed would be an interesting factoid. If I recall correctly, was not one of the “safeguards” against “harassing” the patent holder was that some form of estoppel against this very repeat action with a “or could have brought block for the same filer? Secondarily, it becomes an interesting question as to “same filer” given the thin veneer of the business models of such as RPX and Unified Patents being (effectively) exposed and emasculated. That is, would such “acting as an agent” effectively turn the business model into a liability of being a “super-agent” of ALL of their clients? Their attempt at a veritable “Chinese Wall” being recently torn down…? “The America Invents Act includes an estoppel provision that attaches to final PTAB decisions in IPR and limits the arguments that a challenger can make in future cases. JTEKT argued this estoppel was itself an injury, but the Federal Circuit said it has already rejected that idea. As has been discussed in quite some depth, Article III standing is a very different animal than non-Article III standing, and cannot be “manufactured” through a legislative trick of “co-mingling” different fora that have the different standing regimens. In some ways, this is analogous to the fact that even Congress when operating within its proper domain, may not write laws that violate (other) Constitutional protections. 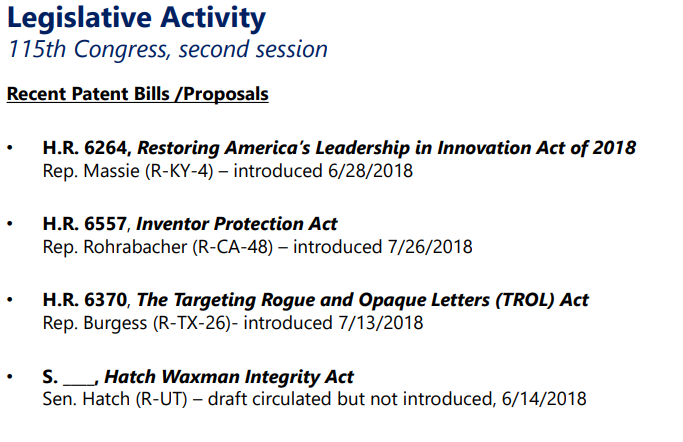 So with patent law (the “operating within its proper domain”), Congress does not have a blank piece of paper to do whatever it wants. Congress cannot do away with Article III standing merely by writing a sentence that an item fully able to be started in a different forum that does not need Article III standing “has a pass” into the Article III arena. Of course, Congress COULD HAVE written a “proper” functioning law respecting the differences in standing, but just because they did not, DOES NOT mean that what they have written provides for what those who want to do away with Article III standing (and cheerlead for the IPR setup) want to have. ***The overlap affects both this thread and the new thread of this blog. But Paul, slide 53 compares the data for Orange Book listed patents to the data for all patents, so you can still learn about the statistics for multiple petitions for all patents by reading slide 53. Yes strong patents I agree. It would be good to see how a patent is being challenged once a first institution fails. An examiner should be happy about how Berkheimer is working out, because they’re getting the same pay for less work. A patent applicant that wants their patent examined should note that Berkheimer, a case which made no substantive change in the law, resulted in 15% (and increasing) drop in 101 rejections. I don’t point this out for 101 purposes, which I’m sure I won’t convince anyone is good if people already think it’s bad. I point this out to show how easily one can vary rejection rates based on procedural chicanery. The word choice “chicanery” seems kind of loaded. Granting that Berkheimer is better described as effecting a procedural rather than substantive change in law, why is this “chicanery“? What is chicanery is what passed as the work of examiners BEFORE they were held to do what they were supposed to do. It was a “procedural trick” by the administration to artificially lower the 101 rejection rate to put it where they wanted the rate to be. It was also implemented via sophistry. Literal “subtly deceptive reasoning or argumentation”. There is no evidenciary requirement to judge a purely legal question. You keep saying “purely legal” and you keep being purely wrong. If you want to properly trace back the tricaney to the Supreme Court, then you have my attention. But if you insist on continuing to act as if your repetition of an error is not an error, you bore me. In case this is a real question and not just posturing, and with all the risk of answering on someonelse’s behalf, I think what Random was referring to is that the Berkheimer MEMO makes it much harder for an Examiner to put together a 101 rejection than it has been. I imagine Random believes that since it is so much harder, Examiner’s will stop making 101 rejections, or will at least make fewer of them. I also believe that Random believes that this was the intention of the Berkheimer MEMO. This may be a natural result of the proper role of an examiner – seeing as an examiner is not a judge who can (attempt) to make law through a common law methodology. For all of 6’s protests and whining, and regardless of whether or not he thinks that his “contract” needs to be explicit on this point, as a member of the executive branch, he is bound by the requirements of patent law and APA law. He mouths “contract law” without understanding what the underlying basis is IS to that contract. This is much like my earlier attempts to get him to see the light that he actually has to read an application in order to examine it (and not – as he had claimed [and claimed that his SPE had told him so], merely read the claims and do a keyword search on some of the claim words). As to what Random makes of this, meh, Random is the same guy that whined that dealing with attorneys is unfair because attorneys know patent law and examiners generally do not. As to “Examiner’s will stop making 101 rejections, or will at least make fewer of them,” I have already posted a comment on this – and we have yet to see any of our typical examiner posters attempt an answer (see post 6.2). As to “I also believe that Random believes that this was the intention of the Berkheimer MEMO.” – I have mixed reactions. If on the one hand the intention is to make examination better by requiring rejections to have been properly made in the first place, and if eliminating spurious rejections because examiners were merely taking the easy path (without proper foundational basis), then I would agree that the intent was to lower this type of bad examination. If on the other hand, you project that Random is feeling that proper rejections are being denied based on the memo alone, than I would point out the fallacy of such thinking and that if Random were feeling so (and I would not be surprised in the least IF Random were feeling so), than those feelings need to be put aside and Random needs to understand the bigger picture of what his job really is. Obviously, it was just posturing. The Office is providing no addition time to compensate for the impact of this “procedural change”. Management isn’t even granting time on a temporary basis. I don’t think it’s unreasonable to describe a discretionarily unfunded mandate as administrative chicanery. It’s your Fn job and was before the memo came out. All the memo does is clarify that you were supposed to be doing your job all along – and your job is not the same as the metrics of your performance. We’ve had this conversation before. Examination has not been paid for “x” hours or whatever your metric is. Stop trying to make your problems be my client’s problems. Stop trying to make your client’s problems with my employer be my problem. No such thing on my part, Ben. You are aware of course is what examination unde the law means, right? I am asking for no more than that. Nowhere included in muh PAP or any contract I signed. Checked, still nothing but what was previously agreed to has been agreed to and nowhere does it mention anything of the sort you’re talking about. Check again – you are not seeing it (and likely, not recognizing the full meaning of what you do see). 35 U.S.C. 131 Examination of application. Yeah that clearly sets forth the director’s job. And I support him getting off his behind and doing it. I’m union. There are labor laws that require negotiations to take place for additional duties etc. Like the guy above told you, stop bringing your beef with the director to examiners. Regardless of anything that you might think needs to be laid out in detail in your union-contract deal, there are fundamental meanings in play here that you cannot avoid (even by clenching tight your eyes). -Analyzes claims for compliance with 35 U.S.C. 101, 102, 103 and 112; conducts examination according to statutes, rules, regulations and guidelines governing the examination process. Which is what I have been telling you 6. You may want to read your “muh PAP or any contract” with your eyes open. Very first part of the details on your responsibilities, 6. How the F did you miss this? ONLY if you as an examiner are not doing your job. Raise your hand (as an examiner) if prior to the memo you were using the “it’s conventional” line and now you are simply omitting examination that would use that line (because actually showing conventionality as you should have been doing all along is too much work…. I can show you at least three examiners on my cases that have “magically” dropped that rejection rather than provide the necessary factual evidentiary support for their prior conclusory assertions. And that’s strictly in July. Do you actually see that happening in your corner of 3600? From what I’ve seen, I suspect these numbers are gamed to be as “impressive” as possible and that most of whatever decrease has happened was in AUs and TCs with management already less agressive about 101. I will say though that the Berkheimer memo has been a healthy sword in my hand cutting through a ton of bogus 101 rejections. Examiners really do not like to do the work of establishing conventionality. the Berkheimer memo has been a healthy sword in my hand cutting through a ton of bogus 101 rejections. Would love to see one of those. Why should Examiners be asked to do “work” that should be done by PTO legal staff? It’s Iancu’s job to establish what is conventional in the logic arts and let everyone know. 1) it is entirely baseless to say that this particular work is work that anyone other than the examiner – doing the examination – needs to do. 2) Establishing what is or what is not conventional is directly related to the individual and specific claim being examined. 4) stop whining and do your Fn job. Maybe but you need databases at the least of things which are conventional. Currently we don’t really have that. Changes nothing to the point here that it is your job. The whining here that you see is ONLY because the degree of search (to establish) is on a higher order than the “cut and paste” that you may have been used to (for either finding against novelty or non-obviousness). Stop being such a misguided bureaucrat. Sure it does. If we don’t have access to that info then it won’t be included in our search. And that’s even presuming that we’ve negotiated for such a search, POPA may need to renegotiate for this additional “conventionality” search into this database of conventional things and until such time it just isn’t included. Right now the negotiated standards are just searching the US class/sub. As that barely has any info about what is “conventional”, it’s not really a search into that specifically. And yes, if you haven’t caught on by now, what is required of YOU to provide the factual predicate per your required APA mandates as a member of the executive branch. Um no, you need to consult the PAP. Why do you keep thinking that this old canard is the case? Labor law exists bruh, you’re a lawltard, learn that it exists. There are no “factual predicates” for pure questions of lawl. You know this lawltard. Clearly you haven’t been paying attention. Did you skip the day that the Berkheimer memo got put out? I would have no problem with this – and this actually reflects my past advice to you when you run into your fallacies of mixing the metrics of your job with what your job is. I read the memo, looks illegal. They happen as you’re aware. Power plays from the executive. Until POPA does so it isn’t required tard. Not today, I spent years providing that “more substance” to that “feeling” already. And the USSC supports muh “feelings” aka the correct reading of the lawl. Establishing what is or what is not conventional is directly related to the individual and specific claim being examined. Sorry, but no. What’s conventional in the computer-implemented logic arts is conventional in the computer-implemented logic arts. Period. You can be sorry for all that you want to be, but you are still wrong, as the REJECTION is claim specific and must flow from that which the examiner is saying is conventional. Further, this is true for ALL art units, so your (seeming) desire to focus only on “logic arts” is – and remains – most odd. Are you sure that you do patent prosecution for real innovators? That is true, at least if we accept that this is a factual question. But anon still finds you to be “wrong” because of his OCPD. Which I find amusing. Maybe address the actual points that I have presented 6 instead of the mindless ad hominem. But it did, though. Nothing in the 101 cases before Berkheimer actually required an evidentiary basis for the “significantly more” step. Right? Such was required (at least inherently) under the APA. The APA only provides broad strokes. The agency-specific rules that implement the APA are provided in 37 CFR and the MPEP – which, compendious as it is, did not provide one word indicating that Step 2B of the § 101 test must be supported by evidence. I don’t believe that the APA categorically requires substantive decisions to be based on evidence. Many aspects of patent examination are largely discretionary – restriction requirements, for instance. Are you suggesting that the examining corps is proceeding unlawfully under the APA by failing to offer an evidentiary basis for every restriction requirement? Those “broad strokes” cover what is required for factual predicates and what is required for proper evidentiary basis of the same. If you think this is at all new, you’ve been doing to wrong. Restriction practice is an abysmal joke – don’t get me started on that. Let’s be clear: the EXPLICIT item could not have been there, given that the Alice/Mayo is newly written Justice made law (in violation of the separation of powers – at a minimum). But that changes nothing for the factual predicates of any law and what someone in the executive branch – for the administrative agency – must follow under the APA. Try to grasp the legal concept here without losing yourself, Dave. 2% less 101’s? I really kinda doubt that is going to show up all that much. I’m not sure where you get the 15% number, the chart shows 2% or less. And further, if that’s the case I’m thinking about that procedural change was a legal change somewhat as it tightens up evidenciary reqs (legal not mere procedure). Presumably RG got it because the reported change from 8% of all examiner rejections being eligibility rejections down to about 6.6% is a 1.4% drop from 8% or 17.5% drop? I think you mean 1.4 percentage point drop. The big problem with 101, though, is the CAFC, which continues to crank out heinous case law provided by science illiterate Google appointed judges. The Big Question, of course, is whether the reduction in eligibility rejections reflects a focused reduction in the number of unwarranted (incorrect) eligibility rejections. Hopefully that’s the case. But I wouldn’t bet on it. What would you bet on as the cause in the reduction? A procedural rule that requires, e.g., that Examiners “prove” that relational databases were “conventional” in 2013. If the Office wants to use “it’s conventional” in their rejection (for ANY art), then the rules for doing so simply (and fully) apply. This is not an unreasonable thing – no matter how much your “feelings” may be bruised by this. Interesting question if the universe of logic patents is truly infinite, but it’s impossible that everyday notions of obviousness would not inhabit the minds of all of the actors in the patent system, especially when it comes to technology like mobile devices and ordinary computers. Blue movies from years ago are the stuff of network TV today- and we all go thru life knowing things when we see ’em as our first, and primary filter on reality. So people always want to make up new esoteric junk to patent, but there may be extrinsic reasons why the peak of this particular storm may have passed. 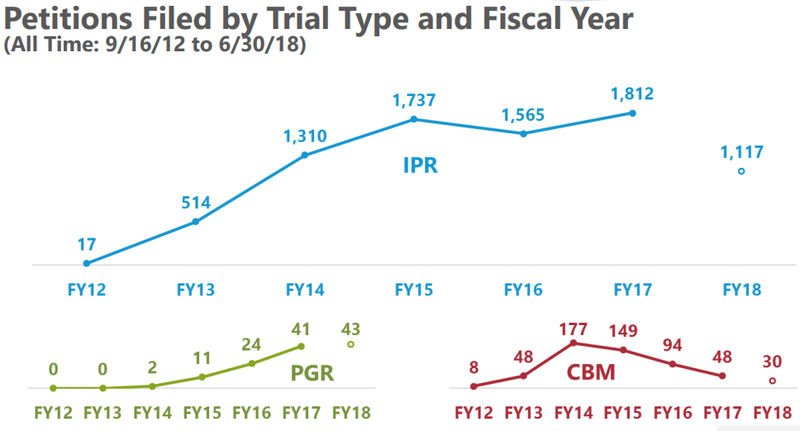 The steady decline in the % of IPR Petitions refused IPRs, and the smaller % of applications getting 101 rejections, is significant. 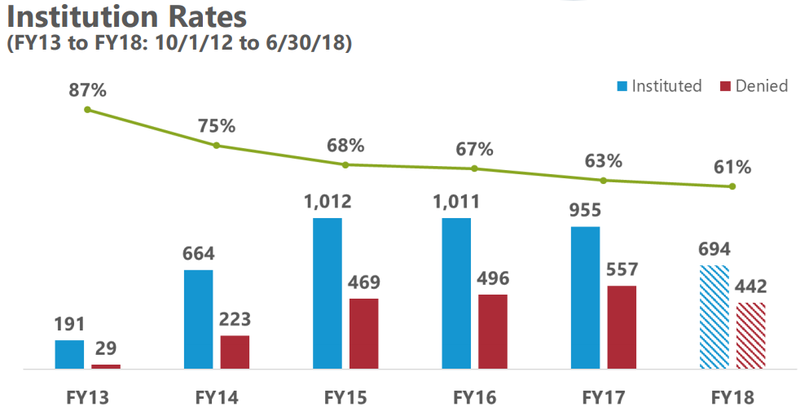 As for how “the USPTO expects that its spending and revenue will level out perfectly by the end of the fiscal year,” the usual way businesses and government agencies accomplish that is end of year spending or end of year delayed hiring and delayed bill paying. BTW, isn’t the Manafort trial Judge Ellis the same Judge made famous years ago for his “rocket docket” patent trials? Why would anyone choose the statistic “% of all examiner rejections [which] were eligibility rejections”? What statistic would you choose instead? If one simply tracks total number of eligibility rejections, that tells one rather little, because the number of incidences of any given rejection should increase simply as a function of the increasing number of office actions issued each year. The only way that one knows that the relative prevalence of a given rejection is or is not increasing is if one tracks it as a percentage of all rejections. The statistic referred to above could be skewed downward, for example, by Examiners making an increased number of non-eligibility rejections. Stats: you get what you measure. If one wants to measure the effect of the Berkheimer memo, one would need to be able to measure instances of rejections NOT being made because examiners either will not – or can not – make (or sustain) a 101 rejection due to the “conventionality” aspect. And yes, that aspect applies fully to both individual items and importantly to ordered combinations (configurations or protons,neutrons and electrons and not just the individual protons, neutrons and electrons). Of course, this is exactly the point I made above (and the point that Malcolm feebly tried to sweep away). I know my own personal experiences on the matter, and I am pretty confident that that experience is most likely prevalent across the art units that treated the “Gist/Abstract” gift from the Supreme Court like a “just-say-no,” get-out-of-real-examination card. Now THAT would be worth graphing. Are you suggesting that applicants in the “logic on a computer” art units want “real examination”??? Whenever – and by whenever, I mean every single time – I see a long list of “LOL” from you Malcolm, it is on a point that is hopeless for you. It’s like a poker tell. Yes, applicants want a real examination. That’s kind of the entire point here in regards to “conventional” and an examination properly establishing that factual predicate. You seem to not be grasping the basics of this thread. Do you really have such a lack of a filter on your feelings that you do not see this? Iancu is probably the single best accomplishment to come from this administration. That is not much by way of salutary accomplishments, but honestly it is more than I was expecting. Iancu does seem to be an example of a non-hack appointment. So far anyway. At least it’s not the sort of extreme hackery we’ve see in education, immigration, environment, etc. But let’s give the man some time. Yes Iancu seems like the type of person that should have been appointed as a judge on the CAFC and not this long list of Google bozos, e.g., Stoll, Taranto, Reyna, Hughes, etc. One area that Night Writer and I can agree on is that I think we need fewer lizard people on the CAFC too. Does that mean I am mentally ill too or that you are not completely mentally ill?